You Are Here: Home » Business » Nielsen & Associates Insurance Services Inc. opens second office in Paso Robles, Calif.
Nielsen & Associates Insurance Services Inc. opens second office in Paso Robles, Calif.
EXETER – Insurance can be as detached as a voice mail referring you to a website or as personable as a familiar face meeting you down the street. Nielsen & Associates Insurance Services Inc. in Exeter prefers the latter and so do the customers here and at their new office in the Central Coast. David Nielsen, president of the Exeter-based insurance company, said the business opened an office in Paso Robles, Calif. on Aug. 1. At a time when most small businesses are contracting or struggling to keep the doors of one location open, Nielsen said he appreciated the support of customers in the area that allowed the expansion to take place. Nielsen said Paso Robles was the most logical place for a second office as San Luis Obispo County has a similar client to mix to Tulare County. He said office is heavily vested in agriculture accounts, ag-related small business and personal insurance for those clients. The primary difference is that Nielsen is insuring wineries instead of packing houses. 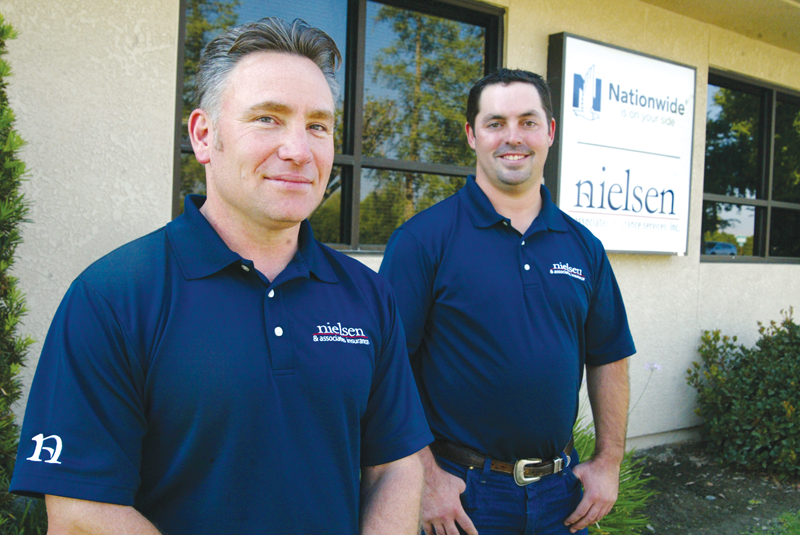 Nielsen said the company has been well received by the ag community, in part, because they are one of the only crop insurance companies actually based in Paso Robles. Nielsen said most of the crop insurance companies that service accounts in Paso Robles are located somewhere else, such as Southern California or the Bay Area. Nielsen said their Central Coast clients are well aware of the rich agriculture produced in the San Joaquin Valley as well as the residents who grow and consume them. As a vacation destination for Valley residents, Nielsen said Paso Robles is a great place to offer home and auto insurance for Valley residents who may have a beach house at the coast. But the real reason for the second location was an idea by agent Brian Gill. An Exeter native and member of the widely known family ranched Gill Cattle Co., Gill saw an opportunity to expand into a new market. Gill, whose family still runs the cattle company that once stretched across five Western states, said he worked in banking and insurance in both the Valley and Central Coast regions while still working as a cattleman. He said most of his clients in Paso Robles came from his contracts at home in Tulare County. Gill said the new office, located at 1426 Spring Street in downtown, instantly reminded him of how much Paso Robles and Exeter had in common. They are both agriculture areas that have developed ag tourism, are both foothill communities and gateways to California’s coastline or the Sierra Nevadas, and both downtowns feature murals and small shops making it a friendly and walkable community. “The transition has been very smooth and just a really natural fit,” Gill said. Gill also brought on Cathy Borg, who has been working as an insurance agent in the Paso Robles area for more than 20 years and who was born in Lindsay, Calif. just down the road from Exeter. “Cathy really brought that local professional and portfolio to the office,” Gill said. David Nielsen, 46, is the third generation of Exeter insurers. His grandfather, CR Nielsen began in the insurance business in the 1940s and his father Bill Nielsen, the current CEO of the company, started Nielsen & Associates Insurance in 1984. For more information on Nielsen & Associates Insurance Services, Inc., call 559-594-5500 in Exeter or stop by their office at 502 N. Kaweah Ave. in Exeter.